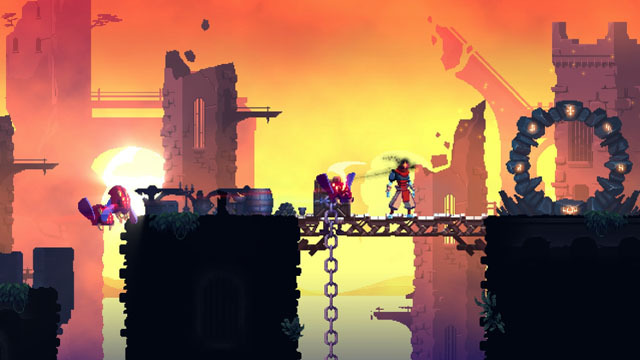 Dead Cells, from Motion Twin, is a roguelike action-adventure inspired by the Castlevania series. Per genre conventions, the game features procedural generation and no checkpoints, so death returns you to the start of the game. However, it also features the open design of modern-day metroidvania titles, allowing multiple routes through the environment, along with a Souls-esque dodge roll. Gameplay takes place in and around a huge castle, with players facing off against various creatures and humanoid enemies - and their elite variants - plus some tougher boss encounters. Players make use of a variety of melee weapons, including spears, swords, and whips, as well as magic and projectile-based attacks. The game is now available for PC, Mac, and Linux via Steam and GOG, PS4 via PSN, Xbox One via Microsoft Store, and Switch via eShop. Check our coverage here.